Of the 54 metro areas surveyed in June 2018, the overall average number of home sales increased 5.4% compared to May 2018 and decreased 5.5% compared to June 2017. 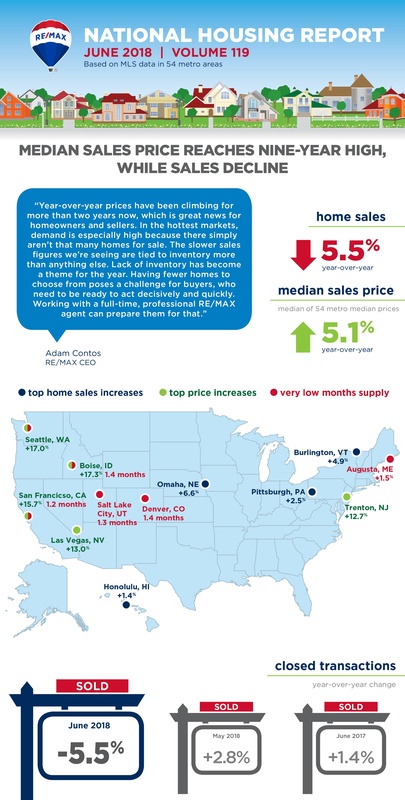 Seven of the 54 metro areas experienced an increase in sales year-over-year including, Omaha, NE, +6.6%, Burlington, VT, +4.9%, Pittsburgh, PA, +2.5% and Augusta, ME, at +1.5%. In June 2018, the median of all 54 metro Median Sales Prices was $258,500, up 2.8% from May 2018 and up 5.1% from June 2017. Only two metro areas saw a year-over-year decrease in Median Sales Price including Billings, MT, -0.6% and Anchorage, AK at -0.4%. Five metro areas increased year-over-year by double-digit percentages, with the largest increases seen in Boise, ID, +17.3%, San Francisco, CA, +15.7%, Las Vegas, NV, +13%, and Trenton, NJ at +12.7%. The average Days on Market for homes sold in June 2018 was 42, down four days from the average in May 2018, and down 5 days from the June 2017 average. The metro areas with the lowest Days on Market were Seattle, WA at 17, San Francisco, CA at 20, Denver, CO, at 21 and Omaha, NE at 22. The highest Days on Market averages were in Augusta, ME, at 97, Miami, FL, at 76, Hartford, CT at 73 and New York, NY, at 72. Days on Market is the number of days between when a home is first listed in an MLS and a sales contract is signed. The number of homes for sale in June 2018 was up 2.5% from May 2018, and down 8.8% from June 2017. Based on the rate of home sales in June, the Months Supply of Inventory increased to 2.7 from 2.5 in May 2018, and decreased compared to June 2017 at 2.8. A 6.0-months supply indicates a market balanced equally between buyers and sellers. In June 2018, all but one of 54 metro areas surveyed reported a months supply at or less than 6.0, which is typically considered a seller’s market. The markets with the lowest Months Supply of Inventory are in the west with San Francisco, CA, at 1.2, Salt Lake City, UT, 1.3, and Boise, ID and Denver, CO, both tied with 1.4.